Russian steel producers are continuing their strategy of reorientation from exports to the domestic market. Severstal, Russia's largest steelmaker and mining company, has already found buyers for its U.S. assets, and another steel giant, Evraz, is planning to conduct an IPO to sell off some of its North American assets. Severstal, the second-largest (by volume) steel producer among Russian companies (after Novolipetsk Steel, or NLMK), announced its intention to sell its U.S. steel mills back in May. The company owns two such enterprises, which brought in 30 percent of its total revenue in 2013. By mid-July, it was announced that the company had found buyers for them. According to Bloomberg, the U.S. company Steel Dynamics Inc. will acquire the Severstal Columbus plant in Mississippi, and AK Steel Holding Corporation will acquire Severstal's integrated steelmaking assets in Michigan. On July 31, Severstal became the highest valued steel producer in Russia. Over the last week, its shares on the London Stock Exchange have risen by 10.2 percent, and its capitalization now totals $8.1 billion. As a result, Severstal’s value has surpassed that of Novolipetsk Steel, or NLMK, until recently the highest valued Russian steel-making company, which investors evaluated to be worth $7.9 billion at the end of last week. The last time that Severstal was worth more than NLMK was in July 2012. "Revenue and production volumes at the overseas plants are at a high level, but their profitability is lower than in Russia," says Andrei Tretelnikov, an analyst at RMG, adding that "the cost of production in Russia is much lower." Therefore, the sale of these assets at what Tretelnikov rates as a good price produces a double effect: It not only increases the value of Severstal’s business in Russia but also provides an opportunity to pay off Severstal's debts. "The sale of the U.S. plants will help to pay off its debts," says Oleg Petropavlovsky, an analyst at the BCS financial group. "Although Severstal will not be able to repay all of its loans completely, the financial situation of the company will improve," the expert notes. Severstal’s total debt at the end of the first quarter of 2014 amounted to $3.55 billion. The company expects to receive $2 billion from the deal involving its two enterprises. However, accounting for the debts of these plants ($1.3 billion), Severstal will receive only about $700 million in cash. Another steel giant for which the sale of an asset will play right into its hands is Evraz, a major (by volume) steel producer in Russia. Since 2008, the company has been going through difficult times and by the end of 2013 had accumulated a record high debt of $6.5 billion. The company has already sold its plant in the Czech Republic and is actively negotiating the sale of its enterprise in South Africa and its steel mill in the U.S. state of Delaware (which stopped operating in 2013). Finally, it was reported that the company is looking for buyers, including Canada’s IPSCO Inc., for its North American assets. These plants, which produce oilfield pipes and railway rails, earned the company $352 million in 2012 – about 20 percent of its total profits before tax (there is no data for 2013 yet). According to recent reports, Evraz plans to conduct an IPO to sell off some of its North American assets (consolidated into Evraz North America). "This is an interesting time for an IPO, as investors are looking where to invest," says Andrei Tretelnikov of RMG. "Judging by Severstal, there is a demand for the foreign assets of these Russian steelmakers." Although the segment of the company's North American assets is very specific (pipe and railway products), these companies’ shares, without doubt, will find a buyer, says the expert. According to preliminary estimates by analysts, the company will be able to get between $1 billion and $1.5 billion for Evraz North America, excluding the company’s debt. These proceeds, according to experts, will be used to repay Evraz's loans. 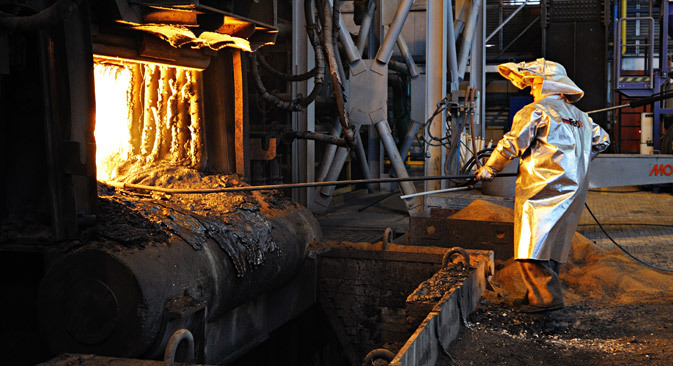 According to experts, the steelmakers’ high degree of activity is explained by the market conditions. "It is profitable for the Russian companies to sell their assets now, while the U.S. market has not experienced a correction and prices have not gone down," Oleg Petropavlovsky explains. One of the reasons why the Russian steelmakers are getting rid of their assets abroad is the growing demand of domestic consumers. "Every year, the Russian domestic market increases in size by 4 to 5 percent," Tretelnikov estimates. Provided the economy remains stable, in seven or eight years’ time there will be no need to export: The domestic market will be large enough to consume all the production of Russian steelmakers. Read more: Will there finally be a payoff for Yukos investors?